A regular worshipper at St Chad’s, Alice has lived all her life in Ladywood. She was a confirmed, had communion and was a regular worshipper at St Peter’s Church on Broad Street, now long gone like many of the buildings Alice would have recognised. After working for many years as a florist. Alice didn’t take retirement as an opportunity to take it easy. 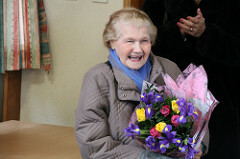 For over thirty years she volunteered as a helper at the St Mary’s Hospice shop in Selly Oak where she made many friends. Her warmth and friendship has welcomed many people who have met her and let us hope she continues to be a regular worshipper at St Chad’s.